While I would like to think that this development will mark the end of the show's schizophrenic storytelling and terrible characterizations, I don't hold out a lot of hope. After all, we've all seen what happened when Glee and The Walking Dead replaced their writers' rooms (and, in The Walking Dead's case, their showrunner), and those changes did nothing to lessen the series' problems: inconsistent characters, inability to stick with a narrative, and heavy-handed "issue" stories on Glee; glacial pacing, wooden dialogue, and boring conversations that are never interrupted by zombie attacks on The Walking Dead. (Although, come to think of it, some zombie attacks would seriously spice up Glee as well). I'll still watch True Blood - it's not like there's anything else to watch in the summer, and it's the only place to get my Eric Northman fix - but, in a moment of optimism, I'd like to offer some suggestions to the yet-to-be-named showrunner who will be taking Ball's place after the show's fifth season airs this summer. 1. Pick one plot and focus on it. One of True Blood's biggest problems over the past few seasons has been the inability to find a storyline that works and stick to it. There was some good stuff in there - the Fellowship of the Sun, Russell Edgington, Jessica and Hoyt (until last season, anyway), and Russell Edgington - but it was always getting buried by terrible plots about witches, fairies, maenads, and Sookie's constant romantic dithering. Cutting the love triangle (quadrangle?) and centering the attention on one story that can involve everyone would streamline the narrative and eliminate the moments spent staring at the screen in boredom, waiting for one of the good stories to start up again. 2. Stop throwing fake obstacles at the characters. I really used to like Jessica and Hoyt as a couple. I did. They were sweet, devoted, and willing to work through their relationship conflicts rather than just giving up and calling it quits. Last season, however, the writers apparently decided that the constant harassment they received from those who disapprove of homosexual - I mean, vampire/human - relationships wasn't enough, and Hoyt suddenly disapproved of the fact that Jessica was a vampire. This could possibly have been a compelling conflict, were it not for the fact they had been together for over a year at this point, not to mention that it made no sense for Hoyt's character. Instead, it simple felt like an excuse to continue the show's game of sexual roulette by pairing Jessica up with Jason. 3. Plot twists need to have consequences. Almost every episode of True Blood ends with a cliffhanger. Sookie just got shot by a witch! Jessica is running out into the sun! Eric is chained to Russell in a parking lot, frying to death in the daylight! The problem is that none of these twists have consequences that extend beyond the first two minutes of the next episode. Sookie is cured by vampire blood in ten seconds, Jason tackles Jessica back into Bill's house, all seven feet of Eric is somehow dragged into darkness and safety by the diminutive Anna Paquin. No one worries about these cliffhangers, because we have been trained to believe that they have no consequences, which drains any tension out of the narrative. 4. People need to die. The end of the fourth season actually showed some promising developments on this front. Lafayette stabbed Jesus while possessed by a witch, Tommy Mickens died of internal injuries sustained from shape-shifting, and Tara got her head blown off by a jealous Debbie Pelt. However, both Jesus and Tommy were secondary characters who hadn't been around all that long, and Tara's character had become so toxic - through no fault of Rutina Wesley's, I should add, who did the best she could with what she was given - that no one cared if she died. (And she's somehow coming back this season anyway, which only supports my point.) 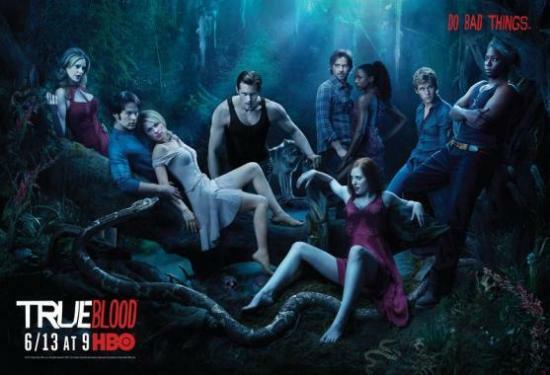 If True Blood actually wants the audience to worry about characters dying, they have to start killing them. If the show pulled a Game of Thrones and killed off a major character, like Sookie or Bill, the audience might start to worry about these people again. 5. Make it about the vampires again. None of the later seasons have been the equal of season one, because that seasons just focused on the vampires, their relationships with various humans and the resulting tensions. We had hints of Sookie's telepathy and we knew Sam was a shifter, but there was no ridiculous fairy business, werewolves, witches, and other supernatural beings distracting from the main story. It wasn't perfect, but it was a hell of a lot better than what we have now.